There was once a time when a sixth of the world’s wealth vacationed on Jekyll Island. Home to the Jekyll Island Club—an exceptionally exclusive, private club that opened in 1888—the island was a warm weather, winter sanctuary for a host of global elite. The club eventually failed, however, as it couldn’t survive the Depression, and today the island is mostly a state park that any traveler can visit. As the smallest of Georgia’s Barrier Islands, Jekyll Island is known for its wildlife and long, white sand beaches. The former “cottages” of millionaire club members comprise the island’s historic district, and four golf courses and a tennis center create a luxurious, oceanfront retreat. Most of Jekyll Island, however, is still wonderfully undeveloped, and the marshes host everything from herons to shorebirds that gracefully cruise through the reeds. When spending time on Jekyll Island, hire a kayak or paddleboard and explore the pristine shore, stopping to appreciate the tranquil simplicity of the island’s natural surroundings. Spend the night at the oceanfront campground or the Jekyll Island Club Hotel—a historic throwback to the island’s heyday that’s a National Historic Landmark. Escape the stifling summer heat at the 11-acre Summer Waves Park, or head to the Georgia Sea Turtle Center to watch as small, endangered turtles scratch their way toward the sea. 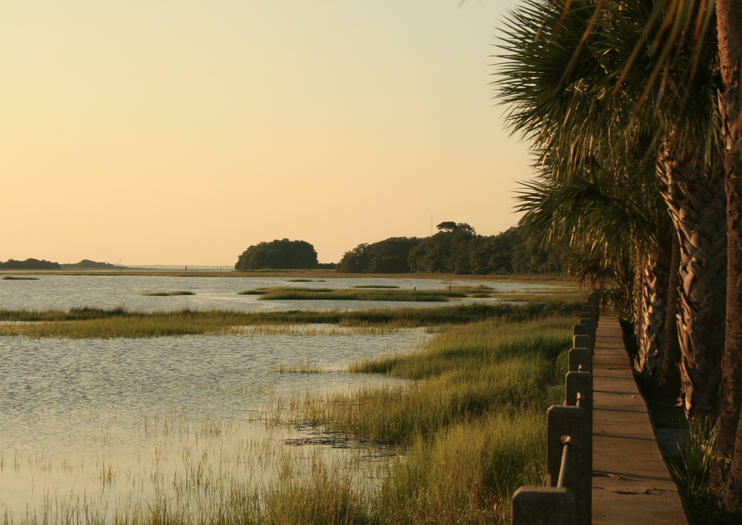 Jekyll Island is one of four Sea Islands directly accessible by road. It is 90 minutes from downtown Savannah and 70 minutes from Jacksonville, Florida, and only 20 minutes off I-95 connecting the two major cities. No pets are allowed on the sand dunes, and low tide is the perfect time for combing the beach for shells.